Once admin cards are purchased, the card needs to be assigned to employees. 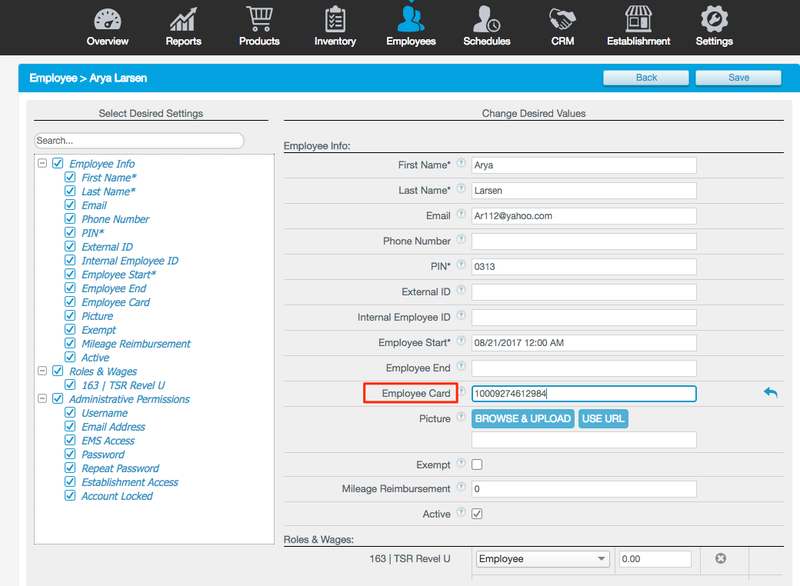 Under the Employee card field, enter the number listed from your Admin Card. The number printed on the back of the card will correspond with a 6 or 9 digit number on the paper list that was sent to the client with the Admin cards. Put the matching 6 or 9 digit number from that paper into this field and click. Lastly, click Save. Before testing on the Point of Sale terminal, refresh the application. If you use unencrypted IDTech card swipe or RFID readers using the RS232 interface to read admin cards, employees can simply swipe their cards on the login screen of the POS to login.